PHOTO CAPTIONS: 1-2. 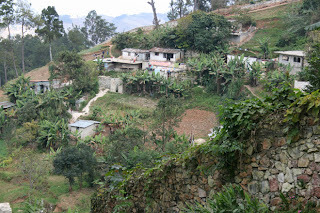 Kenscof is a mountain village 2 hours from Port-au-Prince, 3-4. Kenscof market place, 5. 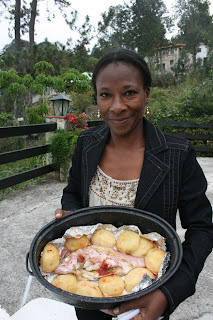 Andre's aunt Micheline accompanied us, bringing along a delicious fish dinner, 6. 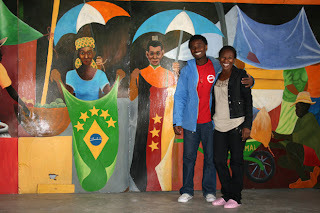 Andre and Miche in front of a mural at our hotel, 7-8. I purchased some nice folk art from village vendors, 9. 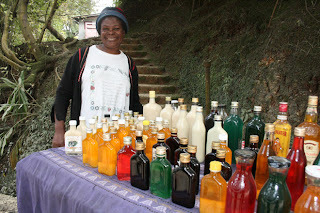 Homemade liqueurs for sale, 10. I offer to lighten the load for a new friend, 11. Baptism day, 12. 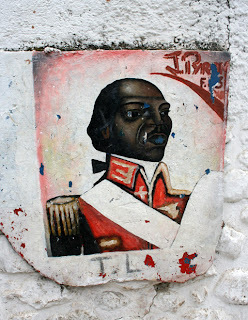 Revolutionary hero Toussaint L'Ouverture, 13. 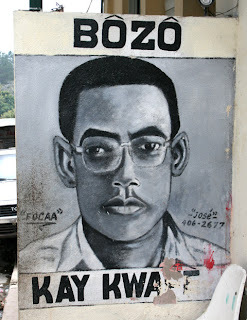 Bozo actually means attractive in Creole. This is an ad for a haircutting salon, 14. 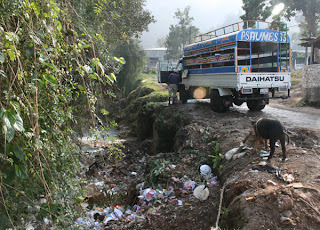 Compared to Port-au-Prince, Kenscof is clean, quiet, cool and safe, but even here they have garbage problems. I had hoped to visit Andre’s childhood ranch in Duvall, an hour or two drive up a treacherous mountain road, followed by two hours on foot. In the old days, his grandfather or uncle would meet them at the road with a horse, but since no one lives there anymore it would have been a bit difficult. I was determined to go, imagining a wonderful sentimental journey, where Andre would recall his idyllic childhood memories. But Andre decided not to go, because he was afraid he’d feel too sad. His favorite uncle who inherited the property from the grandfather was violently murdered a few years ago because of a jealous cousin. The family believes that vodou was involved, so they’ve abandoned the area. Instead, we went to Kenscoff, a mountain village above the turn-off to Duvall at 1200 feet. 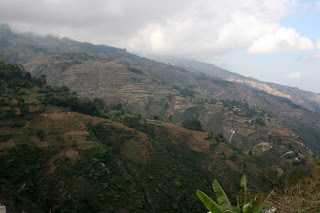 It reminded me of Jarabacoa, Dominican Republic, or the hill stations in Malaysia and Pakistan where the English colonists spent their summers to escape the heat. Andre’s Aunt Miche, the quirky “old maid” schoolteacher, accompanied us. I was shocked when she showed up with a huge travel bag, complete with several pairs of shoes, a huge collection of hair ornaments and jewelry, several changes of clothes – and her iron. Separately, she carried a roasting pan with a home-cooked fish and potato lunch, porcelain plates, forks, knives, and spoons. It was still lukewarm when we got to enjoy it on our hotel’s patio overlooking the valley below. 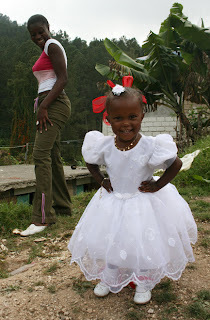 Kenscoff is the antithesis of Port-au-Prince: green and beautiful, quiet and peaceful, safe and small-town friendly. We followed the dirt road higher and higher and higher, finally turning around when Andre announced he was hungry again. Along the way, I bought some interesting folk art. The first pieces were carved from bamboo. I didn’t meet the artist himself, although we peeked in the window of his closed studio. 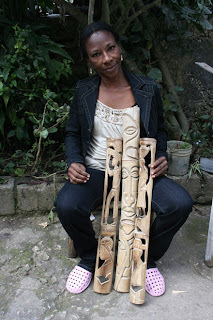 His mother and a younger brother negotiated the prices for the bamboo carvings. They’re usually finished with shellac, but I prefer natural. 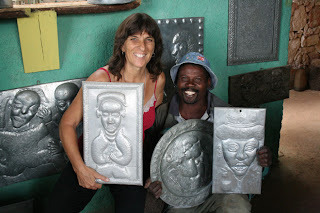 The second stop was with a metal artist called Franck. Years ago, he started out making watering cans. In his spare time, he experimented with the scrap metal. Now he has quite a following of rich Haitians and foreigners from Port-au-Prince in their 4-wheel-drive SUVs. One woman and her driver arrived as we were leaving. Later in the day I spotted some of his larger pieces in the back of another SUV on its way back down to capitol. On Sunday morning, Miche went to church, smartly dressed in an orange skirt and jacket, with matching earrings and barrettes. Meanwhile, Andre watched the soccer match on TV and I took advantage of our hotel’s wi-fi. After, we headed down to Fort Jacques, a short bumpy side trip off the main road. Since last July, Andre has been promising me a trip to the fort. Both Miche and Andre thought I would suffer from riding in the back of an overloaded truck, but for me it’s an adventure. 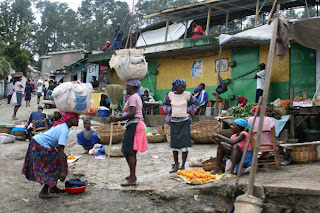 What makes it more interesting is the Haitians love to fight, usually over price. I don’t have to understand Creole to know that all the yelling is over some tiny misunderstanding or infraction. Just before they start throwing punches, it’s all worked out, and everyone’s smiling again. And just when you think they couldn’t fit one more passenger, the trucks stops and a family of five pushes their way in. 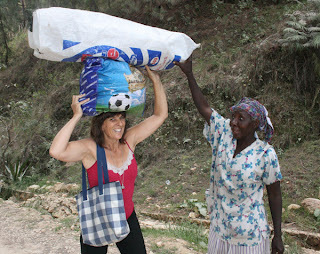 Never a dull moment on public transportation in Haiti! I’ve seen many forts in my life, so I can’t say that Fort Jacques was highly impressive. It wasn’t even listed in the guidebook. The view of Port-au-Prince and the Caribbean Sea below could have been impressive had it not been coated in smog. But what made Fort Jacques special was our 14-year-old guide Jean-Louis. An orphan, he’d learned his trade by accompanying his father, a guide for many years. At first I was suspicious that Jean-Louis might be inventing things. But as time went by, his intelligence and knowledge were unmistakable. He showed us the oven where they baked bread, the water reservoir of 16-foot depth, the prison, the sleeping area. He knew the weight of the cannons, the year the fort was built and how long it took, who they fought, everything. Afterwards, we tipped him generously and I threw in a granola bar, which Daniel had brought from California. Jean-Louis promptly shared the treat with his two young protégés, who had followed along, posing for group photos, and wishing they too could be guides someday. 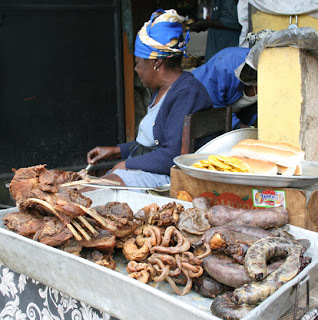 Miche, a schoolteacher, couldn’t resist encouraging them to go back to school. “Passion pour l’ecole, passion pour l’ecole,” she said enthusiastically.